Each tablet contains 200mg of Emtricitabine. Emtricitabine is an antiviral medicine. Treatment of HIV-1 infection in combination antiretroviral therapy in adults. 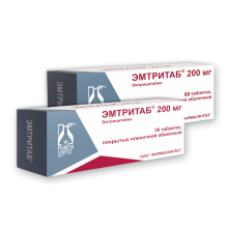 Emtritab® is manufactured under strict control of Russian authorities. Truvada has a specific activity against the human immunodeficiency virus (HIV-1 and HIV-2) and hepat..
Each tablet contains 300 mg of Tenofovir. ..
Tivicay is an antiviral remedy. Active substance : Dolutegravir is an integrase inhibitor of HIV. Na..